Do you know how to properly conduct yourself in a public restroom? What about while in the midst of a profoundly awkward silence? Have you perfected how to get out of helping your friend move? 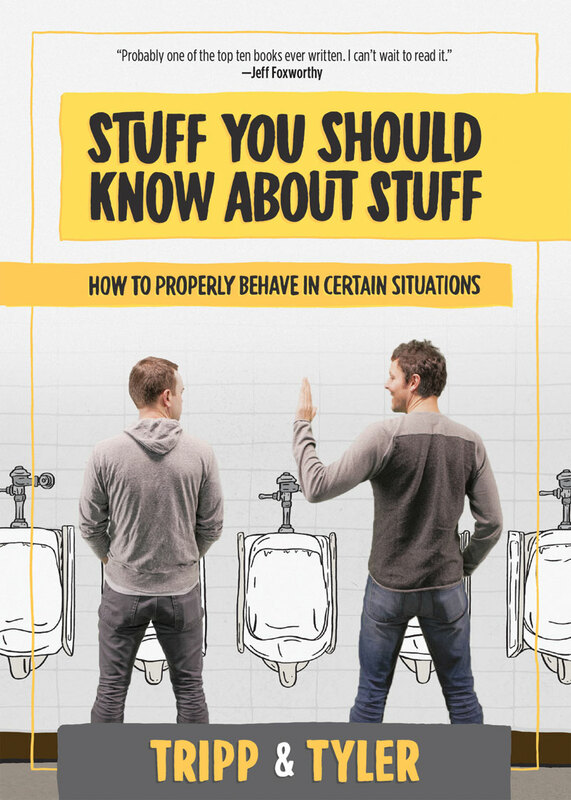 From the guys who created the viral videos “Sh*t Nobody Says” and “Things You Can’t Do When You’re Not in a Pool,” Tripp and Tyler bring you the written word in Stuff You Should Know About Stuff, a guide instructing you how to navigate the treacherous waters of life’s extremely trivial situations. Stuff You Should Know About Stuff places the priority on the trivial experiences of life, because that’s where we spend most of our time; trying to recover from going for the fist bump when a casual acquaintance wanted a high five. Tyler Stanton and Tripp Crosby are a sketch comedy duo most known for their hilarious and viral YouTube videos. They have been writing, directing, and performing their own comedy material since 2006 and have since amassed over 23 million video views and over 65,000 subscribers. Currently they are working full time as comedy writers and performers in Atlanta. Dimensions: 5 x 7 x 1 in.